Climate change has the potential to exacerbate conflict and political instability, and women will pay a steeper price than their male counterparts when it does, says Mayesha Alam, associate director of the Georgetown Institute for Women, Peace, and Security, in this week’s podcast. Alam, co-author of a report released late last year on women, climate change, development, and security, said “women face specific gender-based vulnerabilities during armed conflict.” These include sexual violence and loss of property when communities disintegrate and resources become scarce. Broader national efforts to address the gender dimensions of climate change have been slower. The International Union for Conservation of Nature has been promoting Climate Change Gender Action Plans as a way to encourage states “to address their climate change and environmental degradation needs but also to address political instability, women’s empowerment, and economic sustainability.” So far, 19 nations have taken up the challenge. Sources: Georgetown Institute for Women, Peace, and Security, International Union for Conservation of Nature. 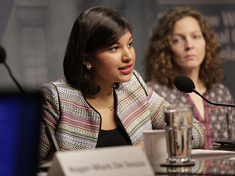 Mayesha Alam spoke at the Wilson Center on April 29, 2016.